Not much at all, it turns out. As of press time, the yellow jackets have announced their intention  to proceed with “Act 4” of their protests this weekend, and the government has responded by announcing its decision  to close the Eiffel Tower, the Louvre, and other tourism landmarks on Saturday. Meanwhile, Paris, for its part, is bracing for another weekend of violence and street battles. For those living under a rock who might not have heard, France has been subject to a series of protests in recent weeks over widespread dissatisfaction with the Macron government and its insistence on pushing through a series of deeply unpopular tax increases and economic reforms. The protesters have adopted the “gilets jaunes” or yellow vests that all French drivers are required to store as a safety measure in the event of a roadside breakdown. It is the perfect symbol for the movement in many ways: it is a standard item that everyone has to hand, it is a visible sign of distress, and it is connected to the fuel tax that was the straw that broke the proverbial camel‘s back and sent the people spilling out onto the streets. Given the number of fake, Soros-backed, globalist-friendly “color revolutions” that have arisen in so many countries over the past two decades, it is understandable if readers maintain some skepticism about the reality of this latest, color-coordinated protest movement. But unlike those well-funded, globalist-backed protests, this one is hoping to ultimately topple the administration of Macron, the former Rothschild & Co. investment banker  who was touted by the MSM as France’s “sensible” answer to the populist wave sweeping Europe. In other words, it’s doubtful that Soros or his fellow travelers are rooting for the yellow jackets to succeed. 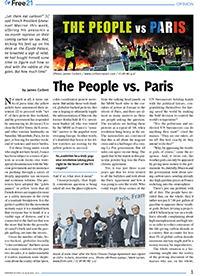 Yes, it was just three scant years ago that we were treated to all the ballyhoo and tosh about the Paris Agreement and how it was going to save the world. 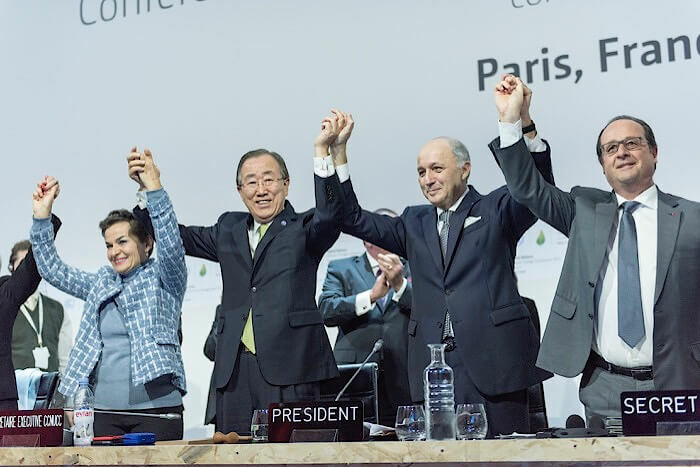 Who could forget those scenes of the UN bureaucrats holding hands with the political fatcats, congratulating themselves for having saved the world by making the bold decision to control the world‘s temperature? There’s just one problem with all of this: The people have decided that, on the whole, they’d rather not pay $ 7.06 per gallon of gasoline to appease those weather gods. In fact, levying a projected € 8 billion/year tax on a workforce already complaining about high unemployment and high taxes in order to reduce emissions of the life-giving carbon dioxide in a country that accounts for less than 1% of global carbon dioxide emissions anyway might just be a teensy-weensy bit unproductive. The whole situation is a fascinating insight into the reality of the growing discontent of the masses who are, on the whole, happy to go along with the global warming swindle [5, 5a-i]… so long as it stays out of their pocketbook. Sadly, as they are only now finding out, the entire point  of the global warming swindle is to transfer funds out of their pocketbook and into the hands of the very corporations  and foundations  that are behind the swindle. France is by no means alone in this dawning realization. Voters in Washington state just rejected a proposed carbon swindle  that would have levied an estimated $ 2.3 billion/year tax on the state’s economy that, even by the UN’s own made up voodoo witch doctor nonsense, would have contributed about 0% to the goal of stopping global climate change (rounding for the nearest whole number). And now the Canadian government is facing pushback on a proposed federal carbon tax from its own provinces . Meanwhile in London the likes of George Monbiot (who is wrong about everything) is trying to drum up a new protest movement  that is going to demand greater action from politicians on the urgent issue of climate change… at least until the protesters discover that they’re just helping to demand their own tax increases. Of course, as you’ll hear any number of talking heads tell you in regard to the yellow jacket phenomenon unfolding in France, this is no longer just about a carbon tax. But that’s where it started, and it is important. So, about that Paris Agreement: Paris called. They want their money back. Special thanks to Lya Fureby for research – Emma Cairo for proofread – Team Free21 DE for layout. has been living and working in Japan since 2004. He started “The Corbett Report” website in 2007 as an outlet for independent critical analysis of politics, society, history, and economics. Since then he has written, recorded and edited thousands of hours of audio and video media for the website, including a podcast and several regular online vidoe series. His work has been carried online by a wide variety of websites and his videos have garnered over 50,000,000 views on “YouTube” alone. His satirical piece on the discrepancies in the official account of September 11th, “9/11: A Conspiracy Theory” was posted to the web on September 11, 2011 and has so far been viewed nearly 3 million times.